Saturday, May 21, 1955, the Phillies are in town and it’s also Ladies Day at Ebbets Field. 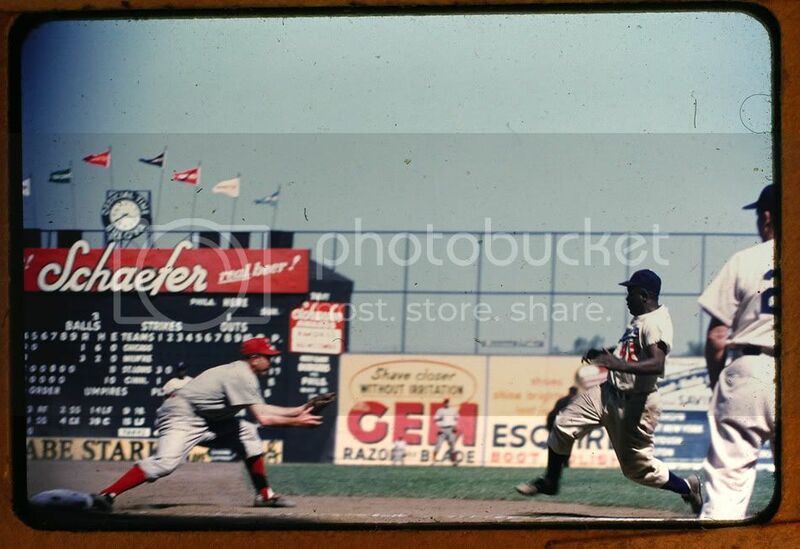 Bottom of the fifth inning, bases loaded, Brooks already up 3-1, Duke Snider up with a 3-1 count, and here’s good old Jackie Robinson – running the wrong way? Turns out he’s just trying to get back to third base after straying too far off the bag, from maybe a ball in the dirt, perhaps a missed squeeze, or was Jackie trying to steal home? Third base coach Billy Herman and Jim “Junior” Gilliam on second watch intently as Phillies third-sacker Willie Jones corrals the throw. Peanuts Lowrey is the distant Phillies’ right fielder. 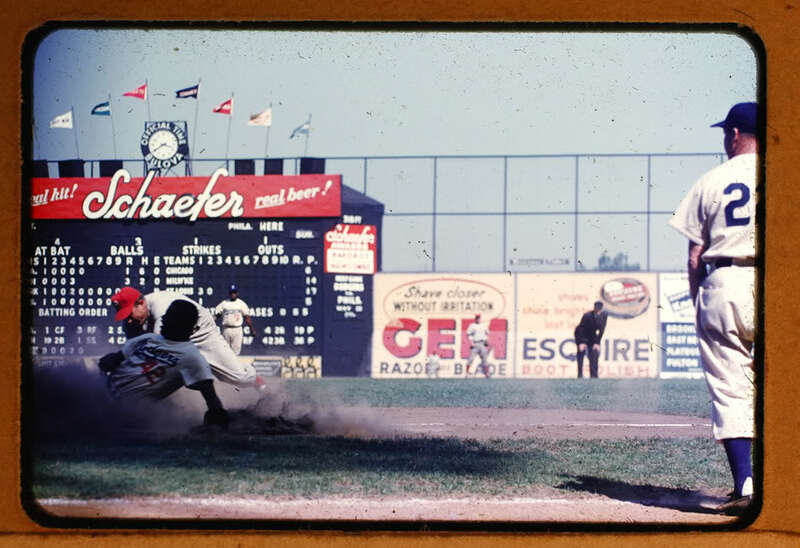 Brooklyn was certainly going the right way in the early days of the 1955 campaign – they crashed out of the gate with 10 straight wins, and after dropping 2 of 3 to the Giants at home, reeled off 11 more to improve to 22-2 and go up 9 1/2 games on New York by May 10. In fact, the Dodgers were on a rare losing streak going into this game, having dropped 4 straight before this contest. 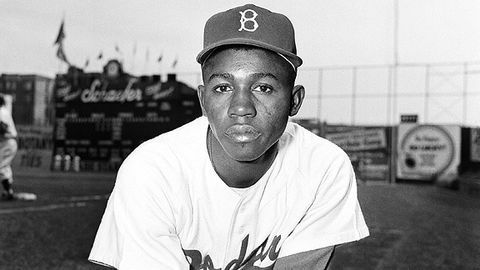 “Junior” Gilliam patrolling second base made sense – he took over the defensive position from Jackie Robinson in 1953 (after they moved Jackie to third to save his knees), and did well, leading the Dodgers in runs scored, the NL in triples, and claimed the NL Rookie Of The Year honors. Gilliam would be the Dodgers’ supersub for many years, even well after they moved to Los Angeles. Junior would have an off year in 1955 (.249), but he did bat .292 in the World Series as Brooklyn took their only crown. He would become a player-coach in 1964, a full-time coach in 1967, and would be one of the longest holdovers from Brooklyn, being a Dodger for over 25 years and most of his life; he would die of a cerebral hemorrhage late in the 1978 season at the age of 49. 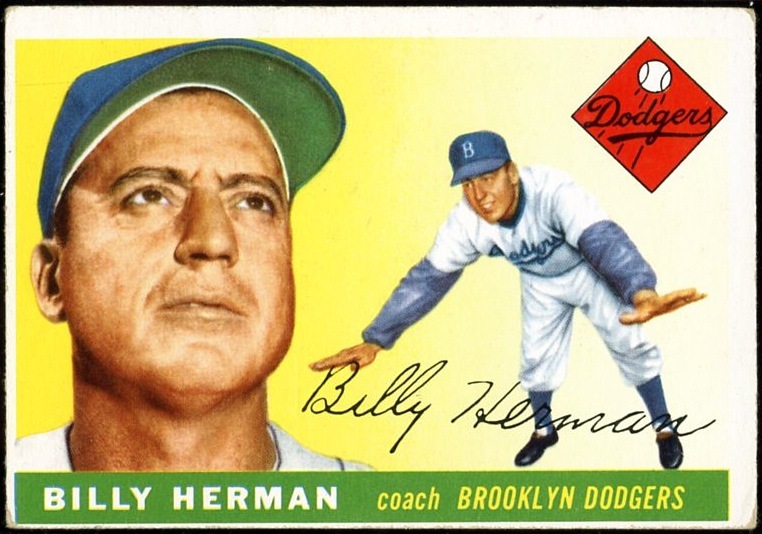 An even better second baseman is standing along the coaching lines at third – Billy Herman was a 10-time All Star and a good wartime Dodger (1941-1946), batting .330 in 1943. He would be traded to the Boston Braves and then the Pirates, both in 1946, and became the Pirates manager in 1947. After a subpar campaign, he resigned on the last day of the season, managed in the minor leagues for a while, and returned to the Dodgers as a coach in 1952, through the rest of their tenure in Brooklyn. He would later become the manager of the Red Sox in the 1960’s. Although he had a lengthy baseball career as a player, coach and manager, his only championship ring would come this season, with the 1955 Dodgers. He was elected to the Hall Of Fame in 1975. 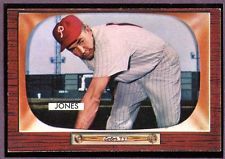 Willie (Puddin’ Head) Jones was the man for the job at third base that day – he was the Phillies’ third sacker throughout the 1950’s, and considered one of the best defensive third basemen of that decade. He had his best years in the 1950-1951 (including the 1950 Whiz Kids pennant winners), and was an All Star in those two seasons, but the lowly Phils wouldn’t return to the postseason for decades afterward. He also happens to be third on the Phillies’ all-time grand slam list (with 6), behind only Mike Schmidt and Ryan Howard. He also died in middle age, at 58 in 1983. And our man Peanuts Lowery way out there in right was in his last major league season. The diminutive outfielder/third baseman/pinch hitter (who was briefly in the Our Gang comedies while growing up in Los Angeles in the 1920’s) would start only 6 more games before retiring at season’s end, and would eventually be a long time coach as well. 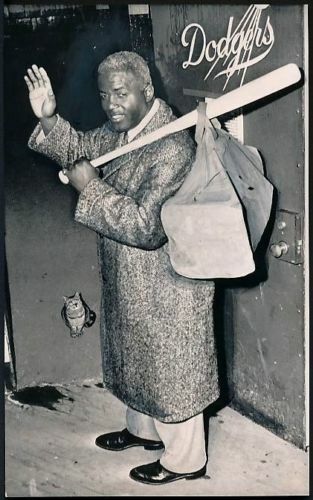 Jackie would rebound somewhat in ’56, but age and the onset of diabetes (a family trait) had depleted his once-great skills, and after he was traded to the New York Giants after the season, he announced his retirement from the game, which he had already planned to do after 1956. Sadly, he also died young, in 1972 at the age of 53, but clearly his legacy will always live on, as known to anyone taking the time to read this blog. But back in a warm Saturday in May, to a gentleman and his lady (with a free ticket) sitting in two snug Ebbets Field seats in Brooklyn, NY, the Dodgers and Jackie Robinson were still the Boys Of Summer, and the Bums were going to live forever. Jackie did get back safely, and scored the 4th Dodger run as Snider also walked. Brooklyn would score 3 in the frame and win the game, 6-4, as Don Newcombe improved to 6-0 (in his first 20 win season) and the Dodgers would find themselves 6 1/2 games in first at the end of the day, with the majors’ best record at 26-8. And the Dodgers would go on to reach the pinnacle of Major League Baseball that fall, but like Jackie above, Brooklyn baseball had only a few stolen moments left.